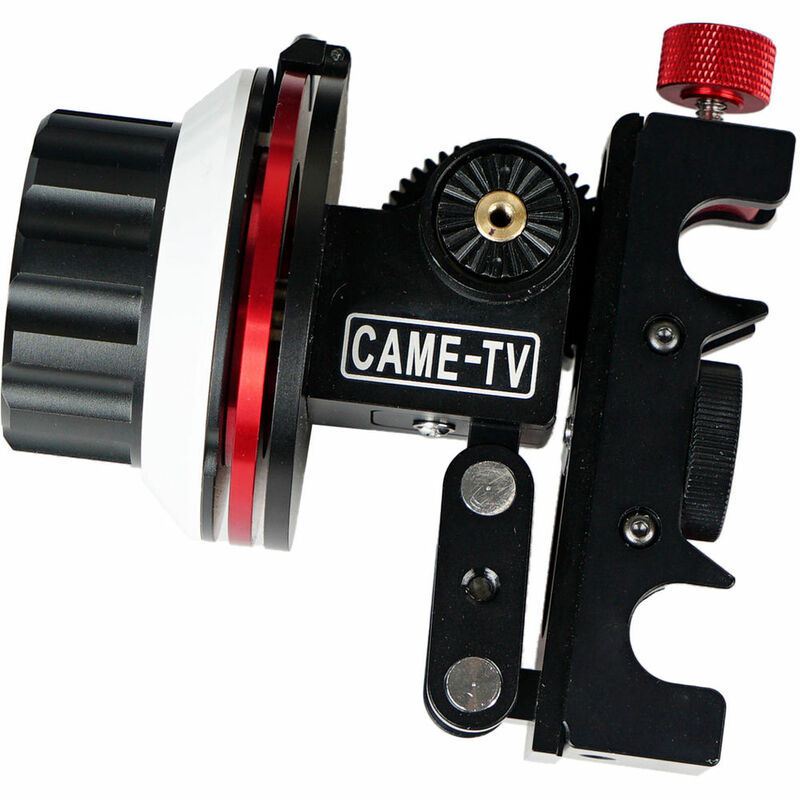 The FF-01 Follow Focus from CAME-TV is a follow focus system with A/B hard stops for a 15mm rod system. The FF-01 is constructed of aluminum and has a bright white magnetic marking disk. It has a smooth, controlled operation; various clamp options; and four gear rings attachment sizes. Box Dimensions (LxWxH) 11.35 x 7.65 x 4.05"
FF-01 Follow Focus System with A/B Hard Stops for 15mm Rod is rated 4.0 out of 5 by 5. Rated 5 out of 5 by James from Very pleased with the FF-01 We used the FF-01 on our first shoot last week, and it worked great. No complaints at all. We used it with a set of Rokinon lenses. The construction is great, and is extremely solid -- no play in anything. The stops worked great as well. Rated 5 out of 5 by VideoNewbie from A great follow-focus Sure, there are other FF systems that don't cost as much, but this unit is very well made and offers smooth rotation w/ hard stops. As soon as you hold it in your hands, you immediately notice the excellent built quality. There's a knob that will allow you to adjust the pitch off the rails, and I like the it has a pivoting arm. I purchased this along with the CAME-TV Cage Rig for use with my GH4. Now that I have a Ronin M, not sure if I can find a way to make it work, but may have to look at wireless/wired FF option. Rated 3 out of 5 by Tim R. from Good for the price I've used many follow focus systems from high end to the cheapest of the cheap. The construction of this product is great, high quality material. However, the two pivot lock system is a major con for me. When you reach min/max focus on a hard stop lens, it usually will loosen the lock and the focus gear will go out of place. This happens to me on a high intensity run and gun situation. For normal usage this unit is fine, I just think it could have been improved by not having a pivot lock to get lenses in gear. Rated 2 out of 5 by Anonymous from nice unit but fell apart Bought this for use on a film and halfway through a little sticker on the end of the tightening knob fell off revealing that was the only thing holding the knob to the screw so now to tighten and loosen it it requires an allen key. Not particularly user friendly anymore. This unit is otherwise nice, though there is about 1 cm of play in the knob which I am just working around. Rated 5 out of 5 by Arnold B. from Takes a little time to get the mechanics right. Once you take the time to learn how to adjust it, this follow focus is terrific. It's sturdy, stays in focus, it's very flexible, adjusts to any lens, and the stops are great. Just shot two days with it and one of the best features is being able to change lenses quickly and easily. Overall I'm happy I saw this product demo on YT and glad I bought it. Worth the money! Can you change the direction of the rotation ? Yes, this follow focus is reversible. Hi, I lost one of the hardstop thumbscrews ... how do I go about getting a replacement thumbscrew? Unfortunately, B&amp;H does not supply these replacement parts. Please contact CAME-TV directly. bit.ly/2bRtXNv. If this is an emergency, I would try to match the thumbscrew at your local hardware center. can this be mounted on a Movcam cage?